(From EPFL News)— FRET is often used with the amino acid tryptophan, which has the added advantage of being intrinsically fluorescent. For FRET, the protein to be studied is modified to contain an acceptor molecule at the right position. When the protein changes its 3D structure, tryptophan interacts with the acceptor molecule, and transfers energy to it. The result is a decrease in tryptophan’s fluorescence emission, which can be linked proportionally to tryptophan’s distance from the acceptor molecule. Since the protein’s 3D structure is already known, FRET can tell us a lot about how it has changed. But there are problems. The lab of Majed Chergui at EPFL has now shown conclusively that FRET readouts can be skewed by the transfer of electrons from tryptophans within proteins. The work builds on a previous paper published in Science (2013) on ferric myoglobins, the protein in our blood that carries oxygen within muscles. 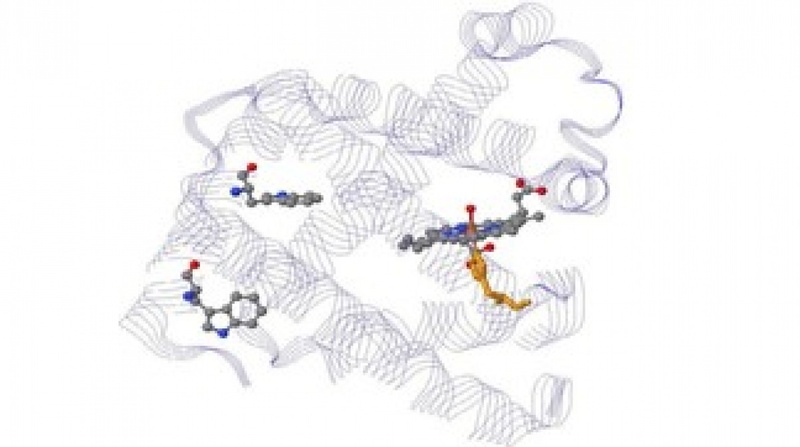 In that study, Chergui’s team showed that tryptophan in myoglobin naturally transferred electrons to the protein’s oxygen-binding molecule, which is called “heme”. Because electron transfer also causes a decay in tryptophan’s fluorescence, it can be mistaken as a positive signal, raising the question as to whether this was also the case in other proteins. In the study discussed here, Chergui’s lab looked at a more biologically relevant class of heme proteins, the ferrous myoglobins, which carry oxygen to muscles. The scientists studied them in their physiological state to see if tryptophan transferred electron to the myoglobin’s oxygen-binding heme molecule. However, they had to work with the extremely short timeframes in which electron transfer takes place. To overcome this obstacle, the scientists developed a new, and, so far, unique spectroscopic tool, called “ultrafast UV two-dimensional spectroscopy”.